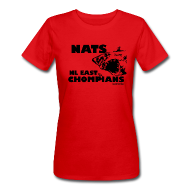 Well the Nats lost tonight in Game 2 of the NLDS (Shark pinch walked again), but let's not forget that the Nats have homefield advantage because they are the NL EAST CHOMPIONS! This post is a little late, but yes, Sharkadina was there to watch them celebrate clinching the NL East and we finally got around to uploading the videos of that fateful night. We encourage you to purchase officially licensed Sharkadina apparel (to help us afford playoff tickets), but if you need something to wear OVER it during these chilly playoff games (and to prove that we are true and honest sell-out @$$sholes), why not these warm licensed Nationals apparel brought you by Kohls? You can probably tell we're experimenting with more ads on the site (which is disgusting, and again, we are total shark sell outs)...if you choose to support Sharkadina by buying a Shark shirt or through our affiliate programs, we would accept it with open jaws.